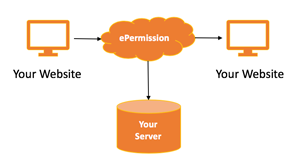 ePermission's API allows developers to integrate ePermission forms in several components such as : Website, Mobile Apps, Subscription / Account Creation Processes & Purchase Processes. The API system is simple to integrate. See the support section for API documentation. • Post to ePermission with pre-filled information. • Get Instant Form Notification (IFN) posts to your servers. • Select form rederict on process completion. • Dynamic redirection based on received parameters.